TechData Co. Ltd. recently provided Oryun Community Church in Seoul and its newly-built religious retreat, Oryun Vision Village, with end-to-end HARMAN Professional Solutions audio and control systems. Founded in 1988, Oryun Community Church is a South Korean Christian organization that operates multiple churches and worship spaces in and around Seoul. The church’s primary facility is known as Oryun Vision Center, which regularly attracts thousands of people for Sunday masses. The organization also recently built a new religious retreat called Oryun Vision Village outside of Seoul, which is available for group rental and also serves as the church’s training center. Facilities at Vision Village include a chapel with 900- and 500-capacity worship spaces and two residence houses with private rooms, meeting spaces, offices and cafés. The grounds also feature a swimming pool, numerous fields and courts for outdoor activities and a serene walking path called the Vision Trail. Having had a positive experience with HARMAN products during their last renovation, Oryun Church recently hired TechData Co., Ltd. to design and install end-to-end HARMAN audio and control systems for both the Vision Center and Vision Village facilities. 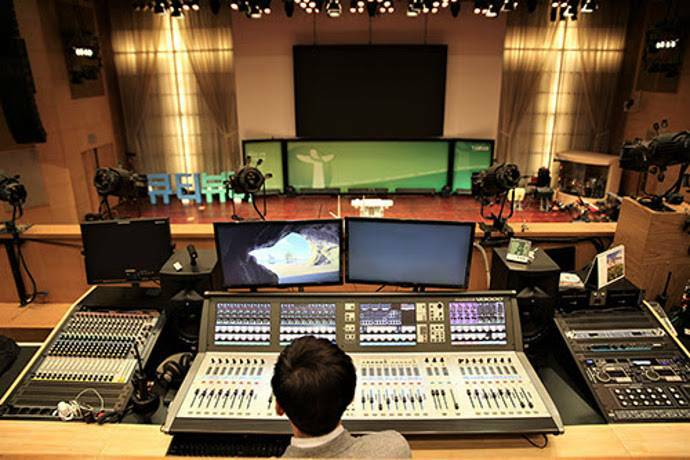 “We were very satisfied with the HARMAN solutions we acquired in our 2015 renovation,” said Sunho Ju, Sound Director at Oryun Community Church. At Oryun Vision Center, TechData selected a combination of JBL VTX V20 and VT4886 line array loudspeakers with VTS S25 subwoofers to provide adequate power and coverage for the main sound reinforcement system. Two-way JBL AC15, AC18/26 and AM512/95 loudspeakers supplement the main system, providing high output and full-range sound in compact form factors with 5.25″, 8″ and 12″ low-frequency drivers, respectively. Crown I-Tech 4x3500HD and 12000HD amplifiers, supplemented by DCi 8|600N and 2|600N models, provide plenty of power and headroom for the extensive sound system. BSS BLU-806 and BLU-50 signal processors form a powerful digital audio network that offers flexible routing and powerful DSP across the complex system. On stage, AKG C568B shotgun microphones provide clean, isolated signals and WMS420 wireless microphone kits give worship leaders and speakers freedom of movement while delivering crystal-clear sound. JBL VP7212MDP powered stage monitors ensure that everyone onstage can hear clearly, and musicians use dbx PMC16 personal monitor controllers to fine-tune their own monitor mixes. Church staff use Soundcraft Vi3000 and Si Expression 2 digital consoles and JBL LSR308 8″ powered studio monitors to deliver clear, powerful live mixes for the congregation. TechData also included a JBL EON206P portable PA system for outdoor and remote events. “Oryun Vision Village requested a design with the same audio quality as the Vision Center’s main hall, using JBL VTX line arrays,” said Seungduk Seo, Tech Lab Lead at TechData Co., Ltd.